An automatic rebuilt transmission service cost is less than a new transmission and is your best bet for a long sustainable transmission that will last several years. The cost for service of rebuilding and or installing your automatic rebuilt transmission depends on the type of vehicle you have, the manufacturer, model and year or your car or truck. In Ft. Lauderdale there are several repair shops that will give you quotes but only a few with very low and fair prices as the labor involved is the most expensive part of the overall cost. Always call around and get a good quote from a reliable repair shop that has been in business for a long time. A remanufactured transmission costs more because it is built at a factory by technicians who specialize in your transmission manufacturer type and then shipped to a shop in Ft. Lauderdale. Automatic transmissions cost a bit more than manual or standard transmissions to rebuild or repair. If you have a domestic model or manufacturer then you cost will be considerably less than an expensive import or luxury car.The competition here in Fort Lauderdale among transmission repair shops is good so that brings the cost down for customers too. Older cars are more expensive than newer cars because the transmission parts are more readily available in late models cars and trucks and the wear and tear on these vehilces are less than older cars. Make sure your transmission repair shop checks all the components and the PCM (Power Control Module) and correctly diagnose the problem because most of the time it is a minor repair of select parts such as adding more fluid, Oil Cooler Thermostat, Drive Shaft, Shaft Yoke, Bad or broken axle, electrical connection, Pressure Switch Manifold, solenoid or clutch issue to name a few of many components that could be inexpensive fixes so you won't need an entirely rebuilt transmission. A rebuilt automatic transmission at our Ft. Lauderdale repair shop on State Road 7 in broward County in South Florida involves a careful process that our experienced technicians and mechanics have performed every day for over three decades. First, the old automatic transmission is removed. The torque converter is then pulled out after the transmission is detached from the engine and the oil pan is removed. The hydraulic signal caller for the automatic transmission is the Valve Body. This is also removed from the transmission, disassembled, and cleaned and then rebuilt. The tailshaft assembly is then removed and cleaned and rebuilt. It is advised to remove the front pump and toss it and install a new one into the rebuilt transmission. 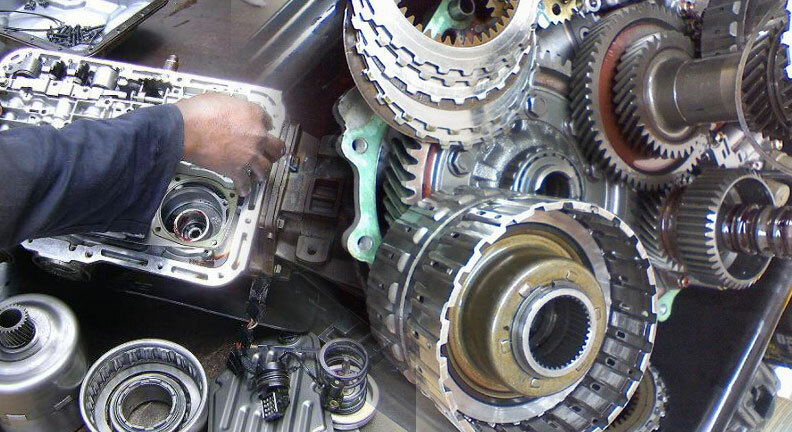 Removing and rebuilding the clutch is also part of the automatic rebuild process. We remove the front and rear servo and then we are ready to begin the rebuilding phase for your vehicle. The last phase of installing a rebuilt automatic transmission involves the accumulator piston and spring, rebuilding the front and rear clutch, planetary gear assembly, and front and rear servo bands. After we reinstall the oil pan and gasket we are ready to let it run to get all the fluids running throughout the automatic transmission. We check the entire system to make sure your automatic transmission is rebuilt and installed properly and functioning at peak efficiency. All rebuilt automatic transmissions have a long warranty so you can drive with confidence and the low cost you paid for this expert service will give you great satisfaction. Be sure to properly maintain your transmission after it is repaired. We hope you will recommend your friends and family to The Fort Lauderdale Transmission Repair Shop for years to come. We also can provide you with a cost quote and service to have a standard or manual transmission rebuilt.